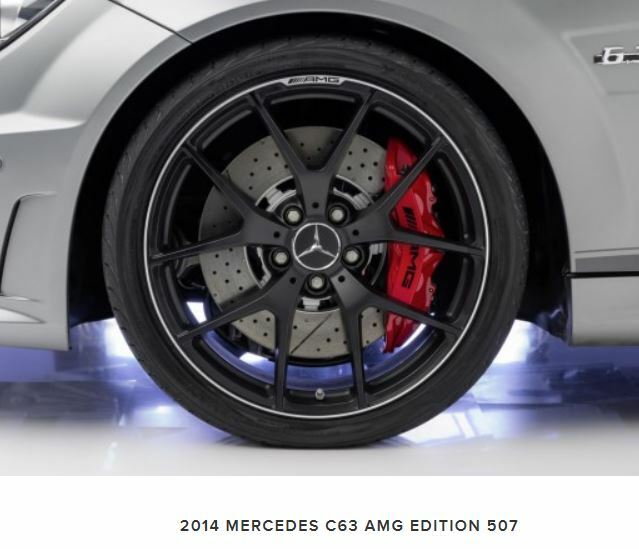 As you can see the black series has much more brakes than C63 while the complete brake kit can be highly expensive, so we are thinking to develop an upgrade brake kits for C63 using B-S rotors which we already make at fraction of what a caliper brake kit can cost. Would like to know if this BBK upgrade would be of interest to you. Last edited by RacingBrake; 12-08-2014 at 12:19 PM. Yes I am interested, does this come with spacers and bolts to make the caliper's fit the bigger disc's ? And will these fit under 19 inch wheels? As long as it is a direct bolt-on kit with everything included, yes. The calipers on top; On lift is C63 and on right is B-S. As you can see the caliper is the same and the only difference is the height of adaptor which we will design and make a same adaptor for C63 to fit bigger rotor. so yes they will be "bolt on" installation. As far as your wheel is the same size as stock B-S (19") they shall fit. Last edited by RacingBrake; 12-06-2014 at 07:58 AM. Front OE one piece rotor is one of the heaviest rotors in any class - a whopping 36 lbs, but when you upgrade to B-S BBK, even it's 30mm (390mm) larger in diameter yet weighs only 28 lbs, so you can save 8 lbs per rotor. The rear OE one piece is 21.5 lbs (330x26), and our rear two piece (380x28) "larger and thicker" is estimated @22 lbs.
" As far as your wheel is the same size as stock B-S (19") they shall fit "
Does this mean I will have to use BS wheels? what about std 19s or in my case HRES? Also can I use MY callipers? Last edited by H20 MRV; 12-06-2014 at 08:56 AM. Basically the BBK only move calipers up towards the wheels for the bigger rotors while you can re-use your calipers & pads (front and rear) - Save a lot of money, and if you have 19" wheels they should fit. Can we buy the stock adapter for black series from dealer? Just in case folks did not think about it: If you are using 18 inch rims for winter tires, this will not work. I am driving that setup and the 507 brakes barely clear the inner rim diameter. The stock brakes were obviously designed with 18 inch rims in mind - and that flexibility was given up with the BS. May be they are only sold with caliper kit only but you can check with dealers about the availability. That's true. For 390mm rotor kit you will need 19" wheels, while 360mm can fit under 18". Last edited by RacingBrake; 12-08-2014 at 10:19 AM. May be they are only sold with caliper kit only but you can check with dealers about the availability. That's true. For 390mm rotor kit you will need 19" wheels, while 360mm can fit under 18". Anyone can pm me the VIN number of black series? 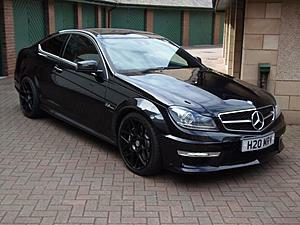 Anyone can pm me the VIN for c63 black series? Thank you all for your interest. We made a good progress in design and can now confirm the rear OE calipers will fit 380x28 rotors, it will be 2" oversize than OE's 330 (13"), and even bigger than black series' 360mm (14"). They will, for sure, dramatically improve your C63 both in braking performance and look. Juts to reiterate, this complete upgrade brake kit will retain the use of your stock C63 calipers & pads, and you would need 19" wheels. This kit is very affordable comparing to aftermarket Brembo brake kits. We expect to ship the kit in late Jan/early Feb if you place the order before the end of December. Brake kits offer will be announced for pre-orders as soon as ready. Is it correct that the 507 and black series share the 390mm brakes? As standard, the C63 AMG “Edition 507″ comes with an even more powerful AMG high-performance braking system featuring compound construction technology. The front axle makes use of compound brake discs measuring 14.2 in. x 1.4 in. The advantages of the compound design include higher fatigue strength and lower warping characteristics. In addition, compound construction discs are lighter in weight and the reduced unsprung masses improve the response of the spring/damping elements. It seems there is a Performance Brake Option which you might able to upgrade to BS brakes. The rotors are composite casted (al hat+ iron dsic) like CTS-V, but the ring is not replaceable. I may be interested come springtime. Order by 12/31/14 and save a 10% pre-order discount. Use Coupon Code "MB-C63-BS" at check out. First three orders will also receive free shipping. Upon order receipt, free shipping will be applied. After Jan 1, 2015 the price will be back to normal. Delivery is expected around February in time for Spring installation. Last edited by RacingBrake; 12-10-2014 at 12:37 PM. After this upgrade your C63 brake performance would be greatly improved and better than BS stock, so if your brake is due for replacement it's an excellent option. Last edited by RacingBrake; 02-09-2015 at 10:19 AM.